Hi all. First post here, asking for directions. So I have a very basic network, with 1 WAN and the router acting as VPN client for provider Express VPN (2 actually, but I believe the number is irrelevant to the case). 16:48:45 openvpn WARNING: --ns-cert-type is DEPRECATED. Use --remote-cert-tls instead. Other than some misconfigurations, I can not find what was causing the disconnections. Or did I took the wrong log? Any pointers would be greatly appreciated, thank you. Can you share more of the VPN Client setup? I actually use ExpressVPN and haven't had any issues. I've been running it for 4-5 months now. Apparently even though the Dashboard displays the error message Unable to contact daemon. Service not running?, I can still use the connection. This is different from my previous experience : the status says the same thing and the connection was actually cut off. It doesn't seem like it's connecting but when I compared through, I can't see anything that looks off to me based on how to setup ExpressVPN. I don't think you ever make a connection at all and it just keeps spinning as it's not connecting at all. The cert looks ok and it's authenticating on the connection. Maybe try to yank the advanced stuff and I have the dont/add remove routes clicked on my config as well. See if we can get the option errors to go away. You are able to test with another client and user name / password and the IP you are connecting to all works to rule out the simple checks? 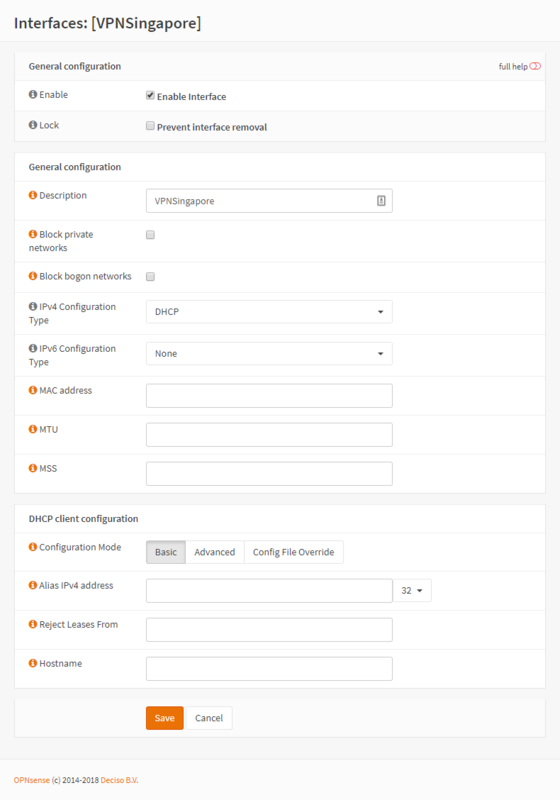 I should have mention this in the original post, but I have made it so that the DHCP clients using the VPN gateway should not fallback to WAN connection on VPN failure. Another thing I crossed off the list is the VPN provider stability. I used its desktop client on my workstation, pinging a remote server on the background while downloading some ISOs, and leave it for about 30 minutes. I found no disconnection at all. Immediately afterwards, I reconnect the VPN through OPNSense and it disconnects within 5 minutes (Along with the same traffic tests on the background). It doesn't seem like it's connecting but when I compared through, I can't see anything that looks off to me based on how to setup ExpressVPN. I am glad I can cross misconfigurations off the list. I don't think you ever make a connection at all and it just keeps spinning as it's not connecting at all. I see, but I believe it actually connects at router's boot. It's just that after a while (About 5-10 minutes after the router boots) they disconnects. If this is somehow caused by the WAN dropping (maybe), the VPN connection should have fail but immediately retry getting itself back. 7. Check all interface : All up and usable. 8. The VPN connection dropped once more within maybe 10 minutes. At least I can cross off WAN dropping as a cause. I will do that and report back as soon as I am able. Did you mean another VPN provider? If so, I don't have one at the moment but I could spin up a trial. If what you meant was another account on the same VPN provider (ExpressVPN), I think I can borrow someone's account. The address that I am connecting to was a domain(singapore-cbd-ca-version-2.expressnetw.com), but I did test them using an IP I got from resolving the domain (There was 2 IP and I tried them both with no effect). Apparently the router got scared of being replaced, the VPN connection (both of them, I have two) has been stable for the last 9 hours and 20 minutes. While this is weird (And might point to a VPN server side problem), I still hope I can pinpoint the problem or at least replicate them for future reference. WARNING: --ns-cert-type is DEPRECATED. Use --remote-cert-tls instead. It happened when the WAN (Not VPN) traffic was under high load. Really sorry that I forgot to close my issue. A backup of all configuration, OPNSense reinstall, and full config restore fixes this when I was migrating my installation.